This will be released to the public in a few weeks. At that point it will combine my text based CAPTCHA system and the new image capabilities. So this system will be easy for humans but will not lookout people with screen readers. This website is switching hosting companies. Please let me know if you encounter any errors. Below is the first screenshot of the upcoming image update to the CAPTCHAv2 system. 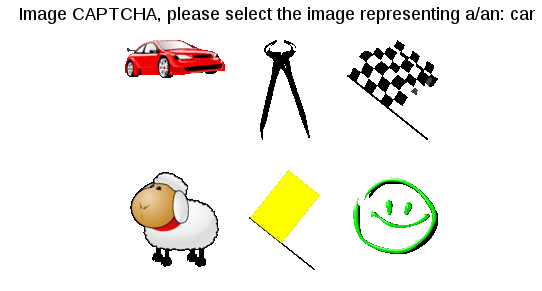 This update will give you the ability to create CAPTCHAS where the visitor needs to identify an image. All images can be tagged with multiple tags to create images with multiple solutions. A quick guide on how to use iptables to automatically block brute force attacks. network-technologies.org will move to a new home today. Some issues may occur while the DNS records are updated. The old server is using ISPconfig to manage the different virtual domains and dovecot as the imapd. The new server will not be using ISPconfig, everything will be setup using config files. I will also switch my imapd to cyrus. I have been monitoring the behavior of SPAM bots when they attempt to brute force the CAPTCHA and I have adjusted my code to add them to the .htaccess file. Once I have tested the latest update I will write a manual and provide a download soon. I am developing new anti spam PHP class designed to protect websites from spam bots and abusive users. - Deny access to comment and contact forms if the CAPTCHA has not been answered correctly after X attempts. I am testing the new protection now, please use the Contact form if you notice any odd behavior from this website. I finally sat down and updated the css layout of network-technologies.org to make it compatible with all current browsers again. It is still looking a bit fugly but the div boxes are no longer all over the place. So it works for now and the eye candy will be added within the next few days. While updating the PHP code of my site I looked at the database and thought it would be a good time to upgrade the data from latin1 to UTF-8. I don't have visitors posting in Mandarin or Japanese but I thought that it would be a good idea to support all the major languages of the World. After all, Change is Good! I am sure most agree with me otherwise we would still be using IPv4 and wage war .... ohh wait, never mind. That's all for now, I'll start working on adding eye candy after dinner. If you are a computer store owner or repair technician you need to checkout WorkOrder TS. WorkOrder TS is an Operating System independent workorder management system designed for computer stores and other service related companies. It only requires a multimedia capable web browser and offers you the ability to easily track your instore repair tickets or schedule your onsite service calls. Version 0.5.0, which will be released in a few days adds the ability to track maintenance contracts/service contracts. You can create an inventory of all devices at the customer's location, then create sub-tickets each time you go out for service. The sub-tickets allow you to document your work step by step and keep track of your time spent on the job. The times are over where you are trying to remember what you did 3 months or a year ago, just pullup the WorkOrder for the customer and you know exactly who did what and when. It is Multi Branch capable, need 1,2,3 ..... 1000 branches? No problem, you can run separate installations or interconnect them all to share a common database. Company Downloader, offer your technicians easy access to repair software but protect your software investment by preventing hotlinking and requiring a valid username and password to download shared files from your webserver. Connect your WorkOrder TS database to Open Office Writer or Microsoft Word and use the stored customer information to fill out addresses and names for your promotional letters or E-Mails. Allow customer's to check the status of their current ticket from the confort of their own home. It is the software you have been waiting for, there is nothing like it! I have written a new modification for PunBB to aid forum administrators in the fight against SPAM. The new mod makes it very tough to implement automatic signup processes so the spammer would have to manually create a user account before he/she can unleash their SPAM bot on your forum. - register.php will no longer accept POST values directly, the input form where a new user enters his/her username and E-Mail address must be loaded first. - register.php will ask a simple question which must be answered correctly. Unlike other solutions, my modifications will ask different questions which are randomly selected from a question/answer file. - Firefox users don't have the problem with a disabled Submit button anymore when they go back to fix a mistake during the signup process. After a short but proud display of the Linux advertisement, Indy car 77 hit the wall after about 30 laps. Marketing Linux® has always been a tricky proposition. As a community, we have relied on corporations who have a stake in the Linux operating system to market Linux to the world at large. Today, we have an opportunity to change that, and make Linux marketing as much a community effort as Linux development. 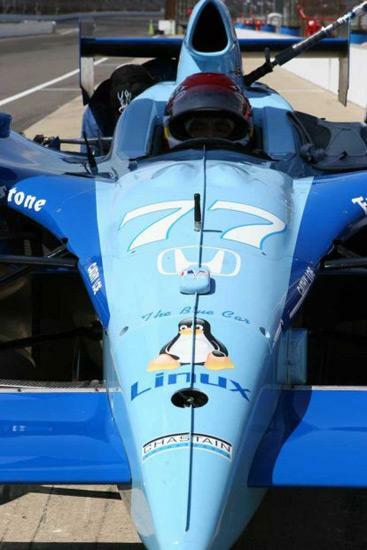 Our goal is simple: we want to collect community donations to enter a Linux sponsored car in the 2007 Indianapolis 500. We need your help! If less than 1% of the Linux community donates $1, this will happen... will you do your part? For the past three years a satellite has circled the Earth, collecting data to determine whether two predictions of Albert Einstein's general theory of relativity are correct. Today, at the American Physical Society (APS) meeting in Jacksonville, Fla., Professor Francis Everitt, a Stanford University physicist and principal investigator of the Gravity Probe B (GP-B) Relativity Mission, a collaboration of Stanford, NASA and Lockheed Martin, will provide the first public peek at data that will reveal whether Einsteins theory has been confirmed by the most sophisticated orbiting laboratory ever created. the Month of PHP Bugs is underway, Network-Technologies.org will monitor all bugs closely to ensure high quality code for all PHP software offered by Network-Technologies.org. Here is a sneak preview of the new robotic projects corner. 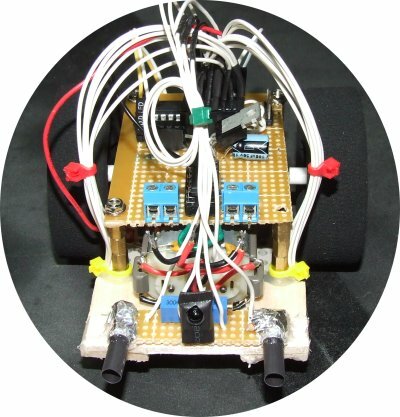 Here you will learn how to build and wire your own robot and sensors. Which parts to use and where to get them. The robot shown in the picture below will be a tournament legal mini-sumo robot. It is currently to specification except the length. The wooden sensor mount makes the robot longer then the maximum dimensions allowed for mini-sumo robots, 10cmx10cm. Running a website is just like owning your own store on the street, actually it's worse sometimes. A website will attract all kinds of human scum attempting to use your website for their own illegal purposes. Most times these evil crackers will deploy bots, autonomous programs, to send out spam or find weaknesses in your website's design. At lot of harm is done when bots get into forums or contact forms. Ion Fire Mode Changer PCBs have arrived! I'm proud to announce that my first professionally made printed circuit boards have arrived, it is my first time designing the board layout and working with SMD components. The two boards on the left are my first attempt which I though would end up too large but it did not. The two boards on the right show the current working design 14mm x 11.5mm, codename: SuperSmall. I ordered the boards from BatchPCB.com, they are cheap, produce quality boards and don't want you to use software which will only work with their own service. Humanity is sitting on a ticking time bomb. If the vast majority of the world's scientists are right, we have just ten years to avert a major catastrophe that could send our entire planet into a tail-spin of epic destruction involving extreme weather, floods, droughts, epidemics and killer heat waves beyond anything we have ever experienced. I have developed a fire mode changer for the Ion paintball gun. The fire mode changer will allow you to change the fire mode setting of your Ion paintball marker without opening the grips first. Imagine playing a scenario game the real way. As far as I know this is the only fire mode changer available for the Ion stock board. The only information available at this time are two Videos. The first video demonstrates the Ion fire mode changer shooting paintballs at a target. The second video demonstrates the fire mode changes with the Ion grip open. P.S. Work order Processing updates will be available shortly. First Installation Manual is ready for download! The Windows, Apache2, MySQL5, PHP5 (WAMP) installation guide is ready for download. This installation guide assumes that your target system is Windows XP/2000/2003. The installation manual begins at the download process and ends at a working Apache2, MySQL5, PHP5 installation on the Windows operating system. Estimated installation time ~15 minutes. This is my first installation guide, please report any problems you have by clicking on Contact above. techno-vampire writes "Carnegie Mellon University is experimenting with a robot receptionist with a personality. The article on NPR tells about the receptionist, named Tank. Tank lives in a computer, with a Frankenstein-like face showing on the monitor. He responds to typed-in questions, including personal ones, with a rather curious personality courtesy of the Drama Department. Among other things, he doesn't seem to like his boss, Dr. Reid Simmons, very much. If asked, Tank will tell you he's also worked at NASA, and failed as a satellite robot. A job at the CIA was also a bust. Dr. Simmons explains that they're trying to make it easier for people to interact with robots, and upgrades are planned."